Beta or Biothane Stirrup Leathers - 1" Wide- New Design 48"
These Beta or Biothane Stirrup Leathers look great on any saddle. Since they are made of Matte Finished Beta or Shiny Biothane, they are easy to to clean and won't fade or crack. Available in 1" Matte Finished Beta or 1" Shiny Biothane. **You may now select BL520 or BR 523 Matte Finished Beta Biothane, which looks and feels like soft leather, if you do not prefer the thinner shiny biothane. 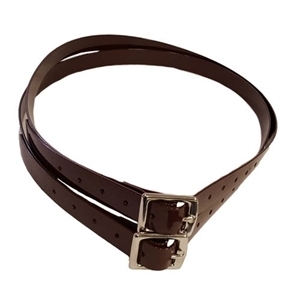 We use stainless steel buckles.This New Design does not have an added layer to reinforce the holes, so the stirrup leathers will be quite pliable, do note that you should inspect the holes regularly for any pulling out or weakening, if this happens, you may need to replace your stirrup leathers. Please note: The 48" is a childs and small adult size. Sold as a Pair!